A couple of weeks ago, I attended an Upgrade! SF meeting filled with artists, writers, theorists, and curators within the new media arts community. The evening was filled with conversation around Chance Operations and stochastic methods related to the art making process. Luke Ogrydziak, principal architect at Ogrydziak / Prillinger Architects gave a brief talk around chance in the architecture and design processes. His presentation touched heavily on the idea of indeterminable factors affecting a final outcome or product. For instance, some of the objects constructed through C++ programming language. Although there is an element of precision through the computation, the digital environment also allows for chance to create sculptural pieces such as Time-Out / Temps Mort (pictured). 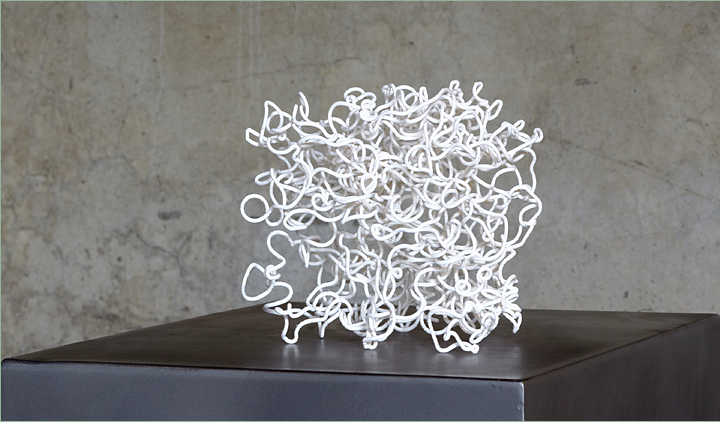 Specific constraints may prohibit physical and manual production of this piece but Chance Operations, with advancements in technology, allow for organic forms to emerge. Chance is a stimulant that requires an agent and a seed. Once you increase the production, you begin to see repeat occurrences, thus chance increases. It is always apart of the process but only through repetition do we see its potential. Another interesting point brought up during the evening was the intent of an artist. Intention plays a major role in how chance is revealed. It’s one thing for an artist to work in solitude and engage in experimentation strictly for oneself. It’s a completely different story and outcome when the artist relinquish control of production and leaves chance up to the viewer thus making them a producer. Essentially, everything produced within an art practice and process still requires calculation and precision. Regarding John Cage’s methods of art and music making, I’m curious how technology eliminates, illuminates, or adds yet another layer or modality of Chance. Even after acts and gestures are performed within an art practice, choice determines an outcome and not necessarily chance. I’m curious, as an artist, a writer, technologist, etc. what do you define as chance operations and how has it played a role in your practice and creative process? Please log onto ZERO1’s Facebook page, make sure to “Like” us, and post your thoughts on Chance Operations. Posted in Art and Technology, Art Influences, Art Practice, Artist's Studio, Creative Coding | Programming, Post Modernism, Visual Arts and tagged as art practice, arts and technology, change operations, matt ganucheau, ogrydziak / prillinger architects, stochastic method, zero1. This may sound facetious, but recently I observed Chance Operations and Stochastic Methods in action through both my cats Vinnie and Fluffy. That doesn’t sound facetious at all. Chance Operations was a topic for discussion at the most recent Upgrade! SF meeting. It’s a wonderful gathering of the new media arts community. I think along the same lines as my friend and artist Matt Ganucheau. Some people leave art making and the creative process to some idea of chance, similar to John Cage, BUT Cage definitely had a method. There is precise moment in any action or gesture that may be incorporate chance but it’s not a driving force or actual element. There is choice. Always. Chance is just an element of the overall art process (anything, really). I just looked up John Cage. ‘Seems he has a profound respect for music.